This weekend while on an off road trip, Jenny’s Jeep began to experience the symptoms of a bad fuel pump. Her jeep would stumble and die at idle. It would only run if the rpms were kept over 1500 and it was low on power. It was also surging as the fuel pump lost pressure. It was making only 20 psi or so and that was simply not enough to keep the fuel from boiling in the hot fuel rail. It was a struggle, but we got her Jeep out of the woods under its own power and got it back to my shop. Fist, we used the failing fuel pump to pump the remainder of the fuel from the tank. I used my fuel pressure tester attached to the fuel rail test port to pump the fuel into a can. I made a jumper wire and attached it to the fuel pump relay socket to force the pump to run. Once the tank was empty, I disconnected the lines from the fuel pump assembly and disconnected the wires. I also disconnected the tank vent lines. Next, I rigged up a lift to support the tank as I lowered it from the Jeep. I then loosened the tank support straps. After lowering the tank a couple of inches I was able to reach above the tank and loosen the filler and vent lines from the tank. I then removed the tank support straps and lowered the tank out of the Jeep. With the tank out, I stood it up and cleaned the mounting flange for the pump assembly with a wire brush. I used a hammer and screwdriver to move the clamp ring off the pump. Then I carefully removed the pump from the tank taking care not to get dirt in the tank. The filter sock fell off and had to be retrieved with a gripper tool. Often the tapered grommet for the pump assembly will stay in the tank as well. If so, this has to be fished out. This one came out with the pump this time however. To test the pump, Jenny made up a container for fuel and reconnected the pump to the lines and wires. The last time I worked on this Jeep there was a leak in the line between the pump and the tank outlet. This time however, there was no leak; the pump simply was not making pressure. Cold it would make only 30 psi not the required 48 psi. When the pump got hot it made less pressure. We measured 20 psi when the Jeep was trying to get home the day before. We then tested the used replacement we had available. It easily made more than enough pressure. And still no leaks. The mounting bracket in this tank has been modified slightly in an off roading mishap so I had to adapt the new pump to fit. After some mixing and matching of parts and some creative routing of the expensive high pressure hose, I got it to fit. Jenny also had to put a wrap or two of Teflon tape on the pump inlet to get the filter sock to stay in place. I carefully cleaned the pump mounting surface and the O ring. I then set the pump in place and tapped the retaining ring back into position. We then lifted the tank up into the Jeep. With the tank almost in place I reattached the filler and vent lines. This was the most difficult part of the job by far. Once the lines were reattached, I lifted the tank the rest of the way back up and reinstalled the straps. I actually forgot to tighten the fuel line clamps before driving it. I should have tightened them right after I reinstalled the lines and attached the wires. We put the fuel back in and ran the pump on the jumper a moment to prime the system and get air out of the lines. When I heard the regulator squeal, I knew the air was being purged. Jenny’s Jeep started right up. It stumbled a moment while the computer adapted to having the right pressure at the injectors again but it settled down quickly. A quick test drive showed it all worked fine. With the exception of the loose clamps on the fuel lines I mentioned earlier. I had to tighten them in the street because I was afraid they might pop off if we drove it back to the shop. Her fuel pressure is back in spec again. Hopefully this pump will last a while. The whole job took about four hours start to finish. The semi annual meeting of the Yahoo Groups XJlist was held once again in Harlan, Ky.
We began the trail runs Thursday afternoon by doing some exploring. Even though the group has been to the park many times before, there are still places we have not been. We began by looking for some places that we had seen on YouTube. First we went in search of Pinball and Railbed. Our maps were somewhat hard to interpret and these trails were not marked but we soon figured out which ones were which. Still being a bit cautious after Adam’s tumble at the end of the last trip, the group decided to avoid the steeper climbs and try Railbed. Railbed begins with a vertical water fall and then proceeds up the hill in a boulder filled gully. No mud, just a lot of rocks. 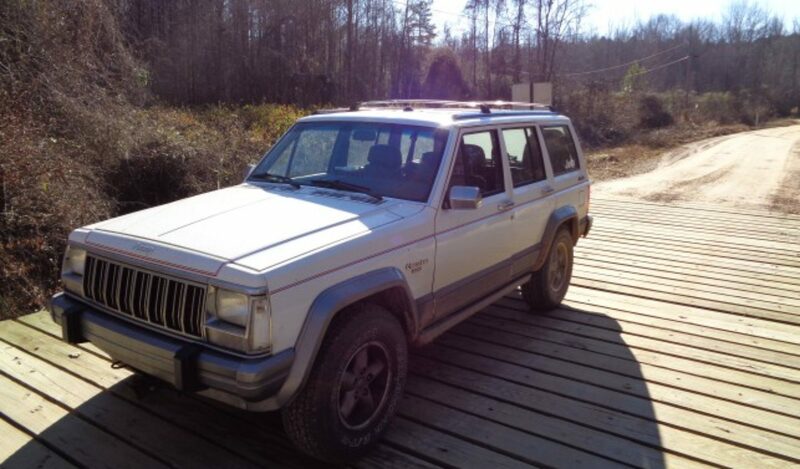 Neal tried the waterfall in his XJ with lockers and 35 inch swampers. There just was not enough room to get his XJ into the correct position to climb the steep slick face of the waterfall. We all took the bypass and headed up the rocky trail. The loose large rocks made lockers a must for the climb. We each tried different lines and eventually we all made it up the trail. This was one of the most fun climbs of the trip. We noticed the big piece of rail road track buried in the dirt beside the trail. This is where the trail gets its name. We moved up to the nearby lower rock garden where we have played many times before. While I was waiting and watching I was surprised when a fellow in a Chevy Avalanche showed up. After talking with him for a few minutes, I discovered he was in charge of parks and recreation for Harlan County and is basically the guy in charge of the park. We discussed the future plans for the park and I learned his goal is to make Harlan County the premier off road destination on the east coast. The new permit money goes directly to the park maintenance and improvement fund. The permitting system was instrumental in getting the land owner to agree to the long term lease needed to get grant money to further improve the park. Turns out he is a avid off roader himself and has personally carved out many of the trails on the mountain. I feel good about having him in charge. We did some more exploring and learned how some of the trails interconnect. Not a bad warm up for day one. On the way back down the mountain to camp, I noticed my voltmeter suddenly drop. Back at camp, I tested to find that sure enough my new alternator had quit charging. Ironically, I bought it right there in Harlan last fall. I quickly pulled it off the Jeep while my burger was cooking on the grill. After a quick snack, I borrowed Jenny’s Jeep and drove into town for a completely no hassle swap at Advance Auto. It was sprinkling rain when I got back so Jenny draped a tarp over my Jeep so I could keep working. Just as I was trying to align the bolts, I heard a loud noise and felt something stinging my legs. I realized it was not just raining but hailing. I quickly dove into my Suburban and waited out the storm. When the rains finally slacked off, I hurried to finish the job before dark. Long summer days are nice. I got it all back together and tested before settling in by the fire to catch up with my friends who I only see twice a year. Friday morning, we awoke to find very slick and wet conditions. Harlan gets very slick form these sudden thunderstorms. Even the road up the mountain, Trail 45, becomes a serious obstacle when it is wet like this. We took time to remind each other of the danger and agreed to have fun anyway but to watch out for each other on the trail and pay close attention to our radios. Our fist challenge was trail 15. This is fondly know to our group as the Slip and Slide after we had to come down it late one evening after getting caught in a sudden thunder storm. We headed up the slip and slide hill. The second climb of trial is punctuated by a small two rock step. It really does not look that intimidating. However, because of the steepness of the climb the near ninety degree turn just before it, it is difficult to arrive that the first rock with enough momentum to get over it. The rocks are also deceptively simple looking. Neal, after having quite an interesting time there last trip, decided to winch up. Evan and Kevin made the climb using lots of throttle and even with out the benefit of lockers made the climb easily. There was plenty of drama associated with the speed but his Bilstein shocks served him well as he hopped over the last two rocks. I thought I had plenty of momentum to make it over the crest but to my complete surprise, I simply bounced off the first rock and stopped between them. Even flipping the switch to the front locker was not help and I found myself in a very scary slide backwards just as Neal had done last year. I quickly regained control and backup for another run. Again I bounced on the first rock and slid backwards. Knowing a unlocked Jeep had just made it up just aggravated me more. I backed up again and using all the traction my Maxxis Buckshots could find and the torque of my Titan Stroker, I blasted up the hill with plenty of speed to carry me over both rocks. I was glad the stock lower control arms were up to the task of continuing to locate my front axle. We did a bit more exploring of the park and made another trip up Railbed just for fun. We had planned to get in Mason Jar before dark but when we arrived there was a large group of Toyota Truggies there. We really expected them to make short work of the gate keeper at Mason Jar with their large bead locked tires and flexible suspensions. However after nearly an hour of watching and waiting, they had only one truck past the gate keeper and it was stuck at the second rock. We decided to call it day and try Mason Jar the next morning. The story of Mason Jar will continue in the next post. Jeeps Running Out of Gas. I was remembering today how we ended up with our cat Ashley. My son Scott had run out of gas in his 1985 Jeep Cherokee. He was too far away from a gas station to tow him and a long way from a place to buy a gas can. I happened to remember that an old friend lived just down the road from where he was stranded. We drove my Jeep over to his house and borrowed his gas can. Which already had gas in it! He told us to bring it back sometime later. Scott took it back the next day. In exchange for the use of the gas can, Scott agreed to adopt one of their new kittens. His brother Will was thrilled. He named the cat Ashley. A few years later, Will had his own running out of gas episode. No cat this time however. He called to tell me his Jeep had died in the middle of the road. In fact, it was in the middle of an intersection. I was quite a distance away so I told him to call our friend Jenny who lived nearby. She got there and with the help of some other motorists who were blocked by his Jeep got him pushed out of the road. I was trying to diagnose the problem over the phone as I drove. I suggested several things to check while they waited. When I arrived, I checked the fuel rail for pressure and only vapor came out. The fuel pump was also making a funny sound. Will insisted he could not be out of gas. Finally I sat in the driver’s seat and tried to start it myself. I noticed there were a lot of miles on the trip odometer and the gas gauge read E.
Despite his assurances that it had plenty of gas, I suggested that we tow it to the gas station just a block away and see what happened. Actually, I realized I could coast to the gas station with just a short tug on the tow strap. My helpers were very concerned with my ability to time a gap in traffic and coast down the hill to the gas station on the left side of the busy four lane road. However, I managed to drive it right up to the pump and stop with no drama. After just a few gallons were dispensed I hit the key and his Jeep started right up. We did later find an electrical problem that was causing stalling and excessive fuel consumption. But in that, instance he was simply out of gas. Our friend Jenny, who had come to his aid, has had a couple of instances where she has run out of gas herself in her lifted Jeep Cherokee. Once, she had just dropped her kids off at her ex’s house when she ran out. I picked up her gas can from behind her apartment and brought her some fuel to get her to a station. Another time, I was just arriving at a business appointment when she called saying she had run out of gas on the side of the highway. She had to wait there over an hour while I finished my meeting and came to check on her. With no handy gas can, we decided to tow her Jeep to the nearest station. The tricky part was negotiating two traffic lights along the way. Since we had to pass right by the sheriff’s office, I was a bit concerned about being cited for improper towing. Luckily, there were no law enforcement officers in sight. Well, at least not until we turned into the gas station. There were three patrol cars in the parking lot and one of them almost pulled in front of us as we turned in! Thankfully they paid no attention to us. Maybe it was break time for them. My funniest running out of gas experience has to be the time Scott and I went off roading in Livingston, Ky. Sadly this place is no longer an off road paradise, but it was then. I knew my Jeep was low on fuel when I loaded it on the trailer but I was not worried because we would be unloading and leaving the tow rig at a truck stop at the entrance to the trails. When we arrived, we called the group and I think it was Matt who agreed to come meet us and guide us to the playground. We unloaded the Jeep and then secured the trailer and tow rig behind the truck stop. The fuel pumps were about two hundred yards away up a slight hill. The Jeep ran out of gas about half way there! We debated on unlocking the trailer and towing the Jeep to the gas pump or waiting for assistance and the embarrassment of being towed to the gas pump. We tried to push it, but the slope was just a little too much for the rolling resistance of the aired down tires. We impatiently waited for Matt to arrive and tow us to the pumps. To add to an already frustrating problem, the fuel pump refused to prime. I had to use a bottle to catch some gas from the nozzle and pour it in the carb to get the old 2.8L Jeep to fire up. I have done my best to keep the tank topped up from then on. I also top off the tank before unloading the Jeep from the trailer when possible. If you have an entertaining running out of gas story, please share it in the comments. To get more distance from a tank of fuel in your Cherokee, see these gas saving tips.